Fiery hot sauces are legion in the Caribbean, most of which contain habañero or scotch bonnet peppers. I find the best way to use these hot peppers is by making up a pepper sauce. This way you can accurately gauge how much heat you are adding to a dish. The heat of individual peppers can vary enormously (even those from the same plant), so a sauce tends to homogenize the heat; making it easier for you to assess the amount to add to any dish. Always wear latex or household gloves when handling the peppers and avoid touching your eyes. Chilli peppers are an irritant and even a tiny amount in your eyes can cause extreme pain. Blend all ingredients to whatever consistency you desire. I like to leave it still quite rough for adding during cooking and smoother for a table sauce. Heat to boiling and simmer for 15-20 minutes. Spoon the cooked sauce into a preheated preserve jar and seal. Leave the jar in a cool, dark place for one month (at least) to develop a good flavour. 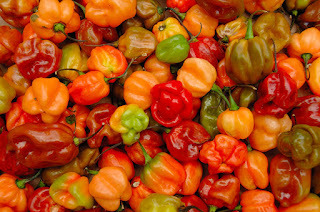 There are many variants on this style of sauce; habañeros or scotch bonnets are available in various stages of ripeness, from green through yellow to bright red, so you can control the colour of the sauce by selecting all single colour peppers. The addition of bananas, mangoes and other fruits enjoy an occasional foodie fad. I much prefer the original and undiluted version. Some recipes involve mixing the type of peppers used; poblanos, jalapeño and chipotle are quite popular varieties. You can achieve widely varying sauces by altering the ratios of pepper types, so feel free to experiment. Use in sauces, marinades and stews, or sprinkle sparingly on meats, fish and rice dishes. I can't live without this sunshine in my life, so I always keep a stock of it.